[In Menace of the Masses] Professor Carey argues that writers such as DH Lawrence, EM Forster and WB Yeats attempted to elevate reading beyond the reach and understanding of ordinary people as soon as ordinary people were finally able to read. Influenced by philosophers such as Nietzche, this elitism and contempt for the common man eventually mutated into a fascination with eugenics and a belief that the survival of civilisation demanded the extermination of certain types of people. If "ordinary" people can read, is reading English written by DH Lawrence, EM Forster and WB Yeats "beyond" them? Is it beyond you? Does your answer suggest that the greatest works of the greatest artists transcend any supposed intention and speaks to everyone, even the little people John Carey wants to protect from such blinding light? 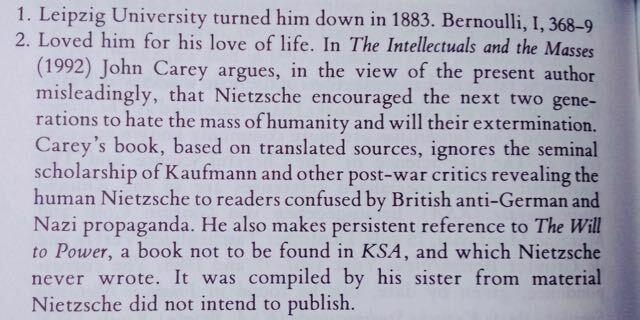 And what does Carey know about Nietzsche? He couldn't even spell it. See also Lesley Chamberlain's note in the excellent Nietzsche in Turin. At last, an American who doesn't overrate Clive James, unlike one or two US litbloggers recently. Gary Indiana provides a clue as to why he might appeal: "James can expound his subjects' accomplishments without oversimplification; what he can't do, apparently, is interrogate his own broad assumptions and prejudices." It's not only in the liberal arts that this applies it seems. Elsewhere, Chandrahas Choudhury reviews the brief tales in Etgar Keret's Missing Kissinger and calls them "potent drops of storytelling". They are indeed, and when he also describes them as "anti-literary" and "anti-romantic", I accept (reluctantly) that these are positives. Yet I found them too glib and self-satisfied to warrant the enthusiasm of the blurb quotes (including Clive James' "One of the most important writers alive"!). I used the word 'glib' in a review - not online - but what I didn't mention (due to space) was the translation from Hebrew. I presume it's accurate in its colloquial tone, though it does tend to emphasise the cultural similarities between the US and Israel rather than their differences. Many read like products of creative writing classes. One similarity might be ignorance of football. In one story, the narrator mentions having Adidas trainers like those worn by "Kroif". The translator evidently didn't know that this refers to Holland's greatest ever player. So maybe Keret's prose is not as carefree as the translation suggests. Keret should attract younger readers; at least those less concerned with form than with content. In this, he's more like a rock star than a writer. Ah, what it must be like to live life to the full, on the edge, like a musician, this one for example.